Development (and its potential/discontents) is the story of Brooklyn, so yesterday Bob Guskind of the Gowanus Lounge did us a service by ranking the top 15 stories of the year. While Atlantic Yards comes in second--a tad generous, I think--more important is the context. 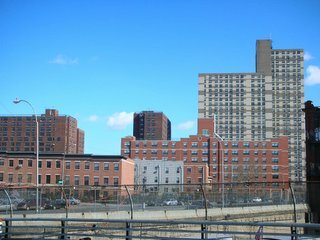 AY surely seems less anomalous as other high-rise development comes to the borough, yet at the same time might merit disproportionate concern, given how the city has since learned, as exemplified in the controversy over Coney Island, both to challenge a developer and to promise a more consultative public process. There was certainly less drama in 2007--there were no Greenpoint Terminal Market infernos or caustic and divisive public meetings about Atlantic Yards--but the change that continued to wash over our borough has been no less dramatic and will alter the very fabric of Brooklyn for many decades to life. The context argument is taken further in an essay headlined Getting Going (With One Loss) by Henrik Krogius of the Brooklyn Daily Eagle. He makes some reasonable points, but they often deserve another dash of skepticism. its opponents are still trying to picture the site as not a logical extension of downtown but as part of a low-rise Prospect Heights residential neighborhood. In view of the towers rising to the north on Flatbush Avenue and to the west in the older downtown, including new hotels, that position becomes less and less tenable, and this may be a good time to revisit the observations made here half a year ago about what the site and its environs are really like. Yes, and no. Certainly the corner of Atlantic and Flatbush would extend downtown and, indeed, that segment was originally included in the Downtown Brooklyn rezoning. Still, the project would represent a significant change in scale, juxtaposed next to and across the street from low- and mid-rise buildings. 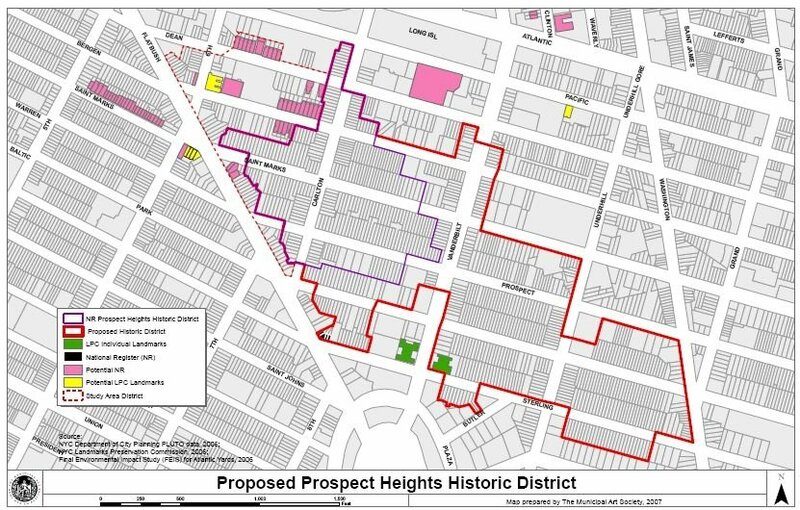 Parts of the site would be immediately adjacent to the proposed Prospect Heights Historic District (right). Krogius suggests that not enough thoughtful criticism of the project design "has been directed at Atlantic Yards, whose critics for the most part simply would like to wish the project away." Yes, Develop Don't Destroy Brooklyn and its allies oppose the project, but BrooklynSpeaks and its allies have offered significant and constructive criticism, especially of the open space plan. Park Slope is not on its doorstep, and Cobble Hill and Carroll Gardens are nowhere near. Only Prospect Heights has proximity, and along the south side of Dean Street where it faces the planned development, an asphalt playground and a parking lot lie between buildings that are for the most part not residential in nature. And Site 5, the parcel to the far west of the footprint, does border a low-rise Pacific Street in Park Slope to the south; the project would introduce a convoluted "Fourth-to-Flatbush two-step," as the Brooklyn Paper dubbed it, steering traffic down Pacific. Beyond that, the UNITY plan would add streets, rather than subtract them, which, if it would not knit together Prospect Heights and Fort Greene, could increase pedestrian flow. Given the proximity to the Long Island Rail Road and multiple subway lines, plus the BAM cultural district, Krogius says there's a strong case for the logic of the arena as the project’s anchor. It is not as if it were being plunked down in the middle of a quiet residential enclave. Yes, there's a strong argument to put arenas near transit hubs, but at the same time, to build this arena, the state would override city zoning that prohibits an arena from being built 200 feet from residences. Krogius notes that the AY plan "already allows for the retention of the former Daily News plant," which I think is a somewhat generous interpretation of a decision that was likely driven by economics rather than esthetics, as Matthew Schuerman suggested in the Village Voice. Krogius notes that five low-rise buildings would be demolished on the north side of Dean Street and suggests, It would be an interesting challenge to [architect Frank] Gehry to leave him more buildings to riff on. Well, it certainly might be that, but it wouldn't fit with Forest City Ratner's plan to use that 100-foot-wide plot for construction staging and temporary parking, and then to build a 272-foot tower (above, at left in rendering). 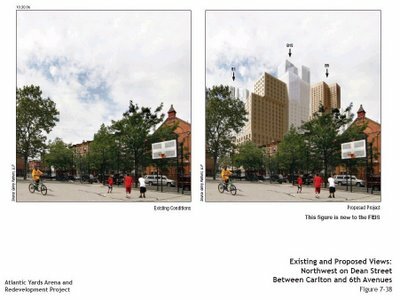 Krogius allows that it's unclear how well AY would be "open to and welcoming of pedestrian circulation," which echoes concerns expressed by BrooklynSpeaks. However, he's not concerned that two blocks of Pacific Street would be eliminated, because it's not much of a through street. Perhaps, but it would be used to create open space in the "backyard" of an extremely dense project. He thinks street-level details will make the difference, while scale is not an issue, as "the site can accommodate the density." I suspect that the developer could certainly ensure the presence of local retail and other facilities to provide some sense of street-level activity. Krogius points out that any new construction would raise questions about gentrification, and that AY would contain 2250 subsidized rentals, "a good percentage by today’s standards." Yes, but the affordable housing was essentially a privately-negotiated zoning bonus, and that brings us back to the fundamental issue of process, the criticisms of which have led even Deputy Mayor Dan Doctoroff to reconsider the city's avoidance of ULURP. Krogius concludes: Atlantic Yards is no longer the colossus it may at first have seemed to be. It is, rather, an entirely sane extension of Brooklyn’s growing downtown. Yes, it is no longer as much of a colussus as at first, but that doesn't necessarily make it sane.